Gary O'Toole is the co-founder of the Kickabout app. A NEW APP aims to change the way five-a-side football is organised. Anyone who has played five-a-sides on a regular basis before will likely be accustomed to the frustration of not always being able to rely on having the necessary numbers of people for a decent game. Kickabout aims to solve that issue. It assists five-a-side enthusiasts by enabling them to connect with other players, join alternative games and book pitches directly. “Basically, Kickabout is a Hailo-style app that allows you to find and organise games of five-a-side football,” the app’s co-founder, Gary O’Toole, tells The42. To give an analogy, it’s like the passengers are the football players and the taxi drivers is like the football pitch owner. O’Toole, who helped start the company behind Kickabout back in August, is planning on launching in Ireland and Britain soon, as well as further afield in 2018. Its inspiration lay in the frustration of cancelled five-a-sides. Essentially, we couldn’t book a pitch through WhatsApp and ensure enough players, and we wanted no more coins at the pitch and and no more phone calls,” he says “We wanted to take the hassle out of finding and organising a game of five-a-side football. “Everybody involved in the business is a footballer. We’d all play five-a-side regularly. We’d always be short of players. Eventually, we realised that the pitch owners were short, at peak hours where they were available, they wanted to get them used more. O’Toole says the app has already attracted a number of subscribers as well as gaining plenty of acclaim within the tech industry. 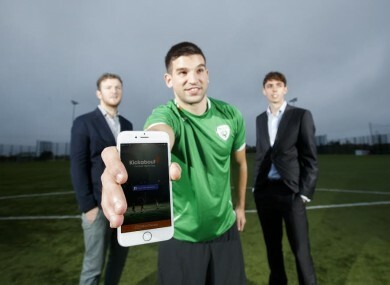 Kickabout earned O’Toole a runners-up spot and a substantial cash injection at Ireland’s Best Young Entrepreneur (IBYE) competition last month, signalling the promise of the initiative. “We get contacted from people in different places even as far as New York asking when it’s ready, ‘can we use it abroad?’ So we’re building some good momentum at the moment,” he adds. And while the 27-year-old Limerick native is enjoying the challenges of creating a successful app, he came close to going down a very different path. O’Toole won a Collingwood Cup with UCD, represented Ireland at youth level and even had trials for Arsenal at one point. So does he have any regrets about not becoming a professional footballer? There might have been a few when I watched Ireland win in Austria as I played with and against Harry Arter and David Meyler,” he says. For more info, you can visit the Kickabout app’s official website here. Email “Introducing Kickabout, the new app aiming to change the way 5-a-side football is organised”. Feedback on “Introducing Kickabout, the new app aiming to change the way 5-a-side football is organised”.